Dr. Simon Platt received his veterinary degree from the University of Edinburgh, Scotland, in 1992, following which he undertook an internship in Small Animal Medicine and Surgery at the Ontario Veterinary College, University of Guelph and a 2 year period in private practice in the England. Dr. Platt completed a residency in neurology and neurosurgery in 1998 at the University of Florida and afterwards spent 2 years as an assistant professor of Neurology at the University of Georgia. In 2000, Dr. Platt returned to the UK where he was Head of the Neurology/Neurosurgery service at the Animal Health Trust until 2006, from which time he has been at the Dept. of Small Animal Medicine and Surgery at the University of Georgia where is currently a Professor. Dr. Platt received the AAVC National resident of the year award in 1998, the BSAVA Blaine award for outstanding contributions to small animal medicine and surgery in 2005, the UGA Clinical Research Award in 2010 and the David Tyler Award for Innovative Teaching in 2012. Dr. Platt has authored or co-authored over 140 journal articles and 30 book chapters and is the co-editor of the BSAVA Manual of Canine and Feline Neurology and the Manual of Small Animal Neurological Emergencies. Dr. Platt is currently the President of the ACVIM Neurology Specialty and Founder member of the South Eastern Veterinary Neurology (SEVEN) group in the USA. 18th to 20th of September 2014. The topic will be Feline Neurology. 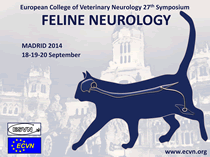 The Local Organising Committee would like to invite you all to our 27th annual symposium which will take place from 18th till 20th September 2014 in Madrid, Spain.